In this article I am going to discuss risk management. In particular, how to understand the risk that you are facing so that you can decide whether or not the risk is acceptable to you and if not, how you can take appropriate steps to reduce the risk to an acceptable level. We all face risks each day in some shape or form. Some we know about. Others we don't. Of those risks that you know about, how do you actually manage them so they are at an acceptable level? The acceptable level is specific to a person or an organisation. It depends on their risk appetite. The level of risk they are willing to carry. Risk matrices based on the likelihood of the risk being realised and the severity of the ensuing consequences are often used to rate risks. Superimposed on these are bands which indicate the desired level of action to be taken and reflect the risk appetite of the person/organisation. 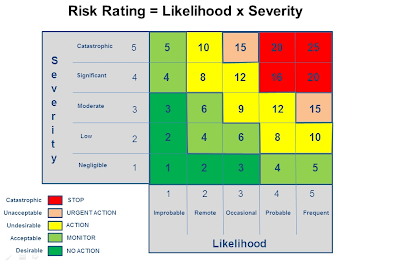 The risk rating and risk band is dependent on the likelihood and severity ratings you assign to it. To assign these with any level of accuracy, you need to understand the nature of the risk that you face. I use an approach to understanding risk which is based on the “bow-tie” methodology. Having identified a risk, I start with identifying the event that would cause the risk to be realised, the undesirable event. Let's take the case of a container of a toxic chemical. As long as the toxic chemical is contained within the container, it will not do damage to people, assets or the environment outwith the container. However, should a leak develop in the container, the toxic chemical will be released into the external environment where it could cause damage or harm. So my undesirable event is a spillage of toxic chemical as at this point the toxic chemical is no longer under my control. In this case I have also identified the hazard associated with the risk, the toxic chemical. There will be a number of failure modes and harm mechanisms associated with the risk so I set about identifying these in turn. First, I consider what might be the possible failure mechanisms that would cause the toxic chemical to be spilled. In doing this I consider what might be some vulnerabilities that would be a contributing factor to the undesirable event and what might be threats which would exacerbate such vulnerabilities. I then identify and add other preventive controls that might exist. Next I look at the harm mechanisms that could exist should the undesirable event happen. It is interesting to note that there is not a one-to-one relationship between the failure mechanisms and the harm mechanisms. 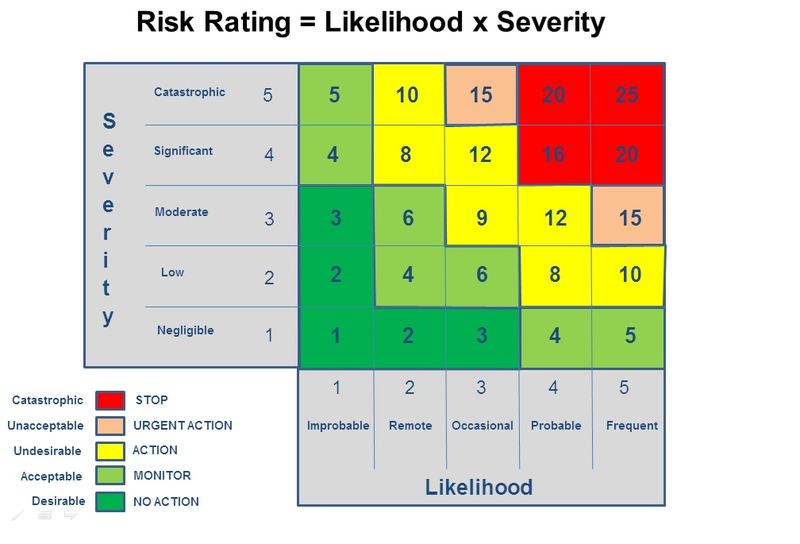 Now that you have mapped out the key factors associated with the risk you can quantify the risk using the risk matrix methodology from a position of knowledge rather than gut feel. You should have more confidence in your rating and it will also provide evidence of what your risk assessment was based on if questioned at a later date. If you felt the risk was unacceptable what could you do to treat the risk and make it more acceptable? 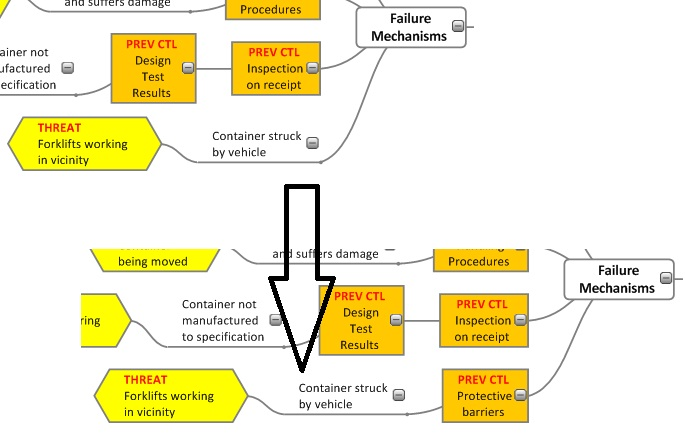 Looking at the map you can see that there is no preventive control associated with the forklift operations and their potential to damage the container. 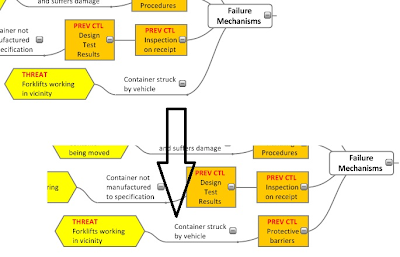 So a risk treatment option could be to erect protective barriers around the container. This would reduce the likelihood of the undesirable event occurring from this fault mechanism. Now this is all very fine in an ideal world, but things change or do not always operate in the way they were intended. Your risk is effectively being managed by the controls, preventive and recovery, that you have in place. Will they always remain effective? That can depend on many things. Let's look at the Preventive Controls scenario. The corrosion is prevented by the protective paint covering which is reapplied every 2 years. What happens if the repainting of the container doesn't happen? What if the paint gets scratched just after it has been re-painted? These scenarios would reduce the effectiveness of the controls thereby increasing (escalating) the likelihood of corrosion occurring. One way over this is to schedule a 6 monthly inspection of the protective paint covering of the container. This is called an Escalation Preventive Control. Likewise the effectiveness of the Recovery Controls may degrade over time. For example, the neutralising chemicals may have a limited shelf life. So you would put in a place a schedule of replacing these chemicals at appropriate intervals. As an added advantage, these controls and escalation control activities can feed directly into your audit, inspection and training programs to give them a more targeted and focused outcome. 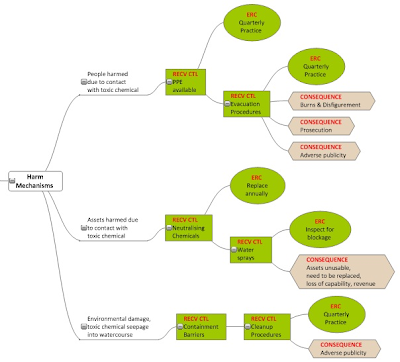 Apply categories (H,M,L) to identify the key mechanisms which effect likelihood and severity. I use the filter to focus in on the key failure and harm mechanisms. Add a title for the risk using Floating Text. In describing the risk I use the X, Y, Z approach to describe the risk. The issue/concern ‘X’ that happens because of ‘Y’ resulting in ‘Z’. E.g. People harmed and assets/environment damaged because of a spillage of toxic chemical due to the container being ruptured. Use question lists to cover different perspectives on severity so I take a comprehensive view. E.g. don’t just consider injury. What about financial impact, bad publicity, loss of production/capability, legal and regulatory consequences? So there you have it. An approach to documenting and understanding the mechanisms associated with the risks that you face and have to manage. Using this approach you will be more aware of the controls that you have in place to manage risk. If you share this information with others, then they will understand why such controls are in place, what these controls are intended to achieve, how they should use/operate these controls and the potential ramifications if they are not implemented or applied properly. Such an approach increases people's awareness of risk and increases the knowledge and ownership of risk within an organisation. I hope this article will encourage you to use MindGenius to help you better understand the risks you face and ultimately manage them more effectively. 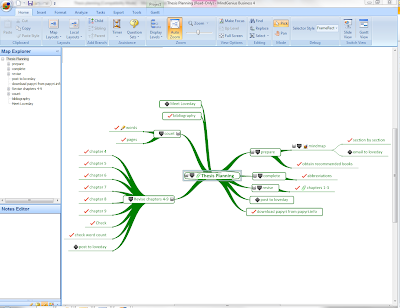 Last year we featured an article on Mind Mapping Software and PhD Research. 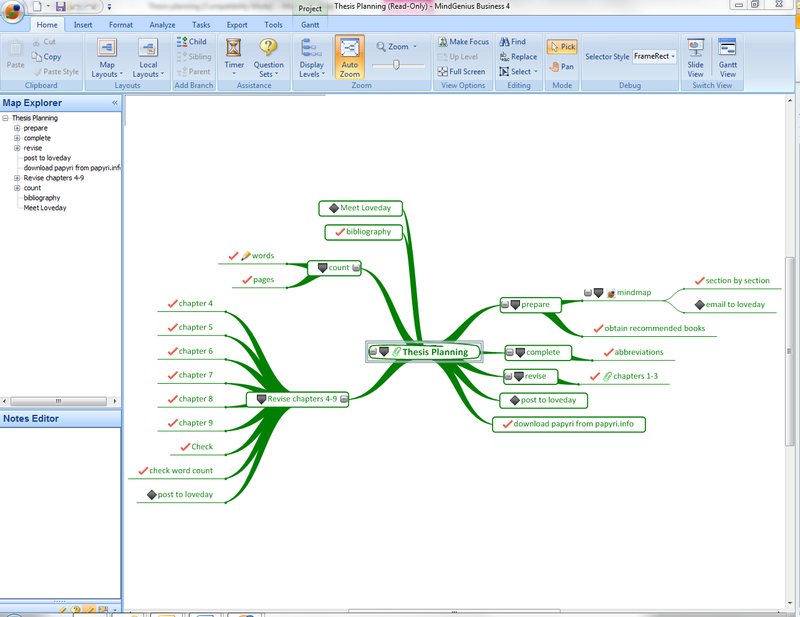 Peter Roberts who has been working for the last 6 years on his PhD into the meaning of 2 Greek words, outlined how he was using MindGenius mind mapping software for his research. “On researching and writing up or delivery: A don at Oxford told me years ago: “learn by writing.” So as I’ve been researching, I’ve been writing various parts of the thesis, but not in any particular order. For instance, my thesis is based on two word studies. I had to do the research for these first because my conclusions would depend on them. Having researched and written up my findings, I then had to research the subjects which the word studies suggested (i.e. Roman patronage and the situation in the church at Corinth which Paul was trying to sort out, partly by his use of the two words I’ve been studying). I wrote further sections to cover these areas. All the time I was scribbling down possible outlines for my conclusion. (As a preliminary to all this, it’s a matter of deciding on a broad research field and then, by reading and writing, narrowing it down until you have a manageable subject. On the way you often find other subjects which you try to remember so you can work on them when you’ve finished the PhD. 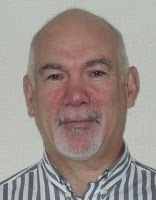 From the outset I had an outline of the structure of the thesis, which we revised continually throughout the project as my supervisor and I recognized extra material required or information I could omit. When we felt I had collected sufficient material and had a viable argument with a sound conclusion, we decided to change the emphasis from researching to writing. (Of course the final deadline looming also affects this decision). The aim was to revise the whole thesis in strict sequence using the various chapters I had already written so that we could see that the argument flowed and fitted together logically. The final stage is then to revise the complete thesis chapter by chapter until we are satisfied that everything is in that needs to be in, and no more, and that it all makes sense (examiners don’t like to be puzzled). This is the stage I’m at now. It’s when you realize what a pedant your supervisor is and how vast her knowledge of the subject is and you wonder why she is not writing the thesis instead of you!! But in fact you are grateful because she picks up all the stupid mistakes or inconsistencies which could make the end result a real mess. 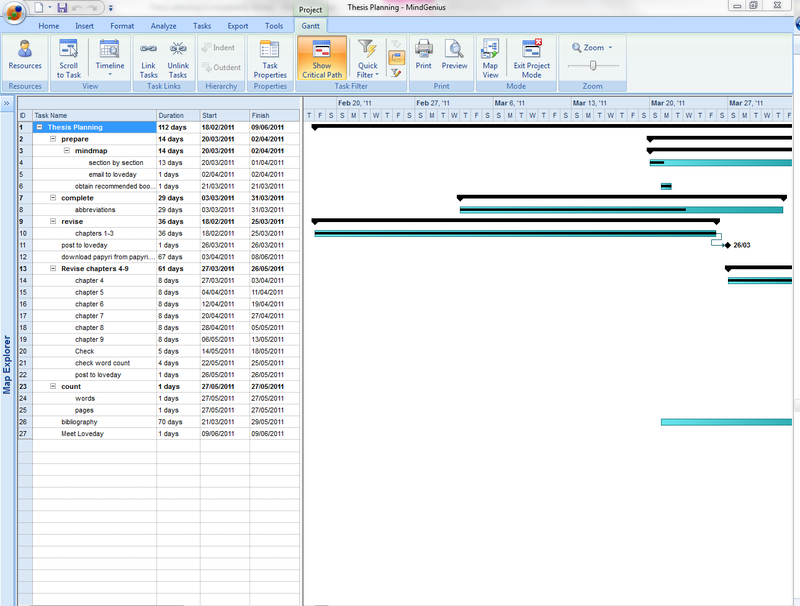 The Gantt view in MindGenius helps because firstly it forces you to analyze the job and break it down in terms of specific tasks as well as in terms of specific periods of time. 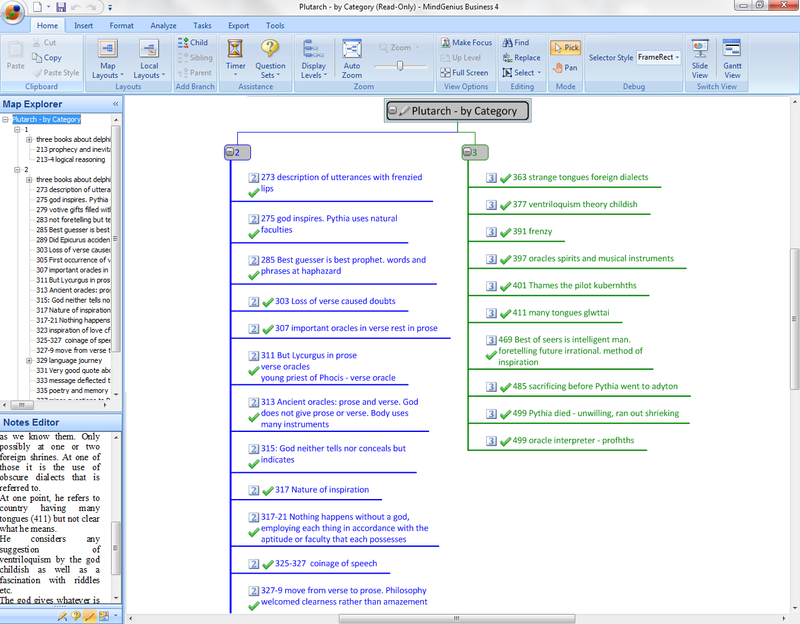 The project is really just in two phases now: completing the chapters revision, and topping and tailing – abbreviations, bibliography, title page, preface, printing and binding. The division of time is very important for me with a project this size. I’ve never written something 70,000 words long before over so long a period. So it’s essential to have a timetable, which enables me to focus on one chapter a week in my case. The first two chapters on the chart took the whole week allocated to each of them. The chapter I revised this week only took me a day because things went smoothly. This has given me more time to work on the following chapter which is lucky because it is going to need a lot revision even down to changing the basic structure (a “now she tells me” situation!) of one whole section of it (I stopped myself panicking about that by, of course, producing a mind map of the new structure: a sort of researcher’s/writer’s valium). The chart is working well. I’ve printed it out and pinned it up next to my desk. At the moment I’m ahead of schedule which for me is a miracle: I’m a deadline man: I work best when I’m up against a deadline. Take the deadline away and I drift. 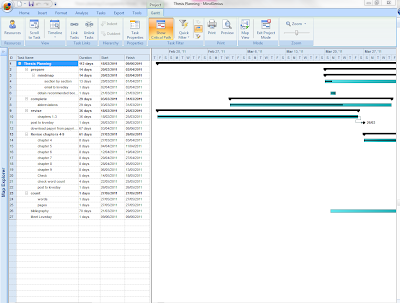 The Gantt chart gives me a whole series of manageable deadlines. The division of the tasks is important as well: which order to revise in, for instance, so that I can concentrate on the chapter in hand rather than flit about from chapter to chapter as the panic takes me. But then there are the peripheral tasks which must not be forgotten, like abbreviation lists, bibliographies, checking and rechecking, printing and binding. Every time I look at the chart, I’m reminded these essential tasks have to be completed so they don’t slip below the radar. These are things I can do piecemeal when I don’t feel like anything more demanding. But they have to be done. And the Gantt chart helps with that. It’s also good to be able to go into a task and raise the completion level, especially to 100 %. It gives my mind a chance to move on to the next chapter or task. 1. Make the currently selected branch the core by selecting F6. You can always return to the Central Core branch by selecting Ctrl+Home. 2. Use the ‘End’ Key to navigate to the last child of your current selection. 3. To correct capitalization typos use Shift + F3 to toggle through the Change case options. 4. Copy (Ctrl+C) and Paste (Ctrl+V) can be used to copy the selected branch (automatically includes the child branches) and paste them to other branches or maps. 5. Use the Ctl+ + and Ctrl + - keys to zoom the map in and out. OR While holding in the Ctrl+Shift keys, use the Mouse wheel to Zoom in and out. 6. To insert a Parent branch (i.e. in front of the current branch, Select Ctrl+Shift+Ins. 7. Bring the notes pane into view and focus in it at any time by selecting Ctrl+1. 8. 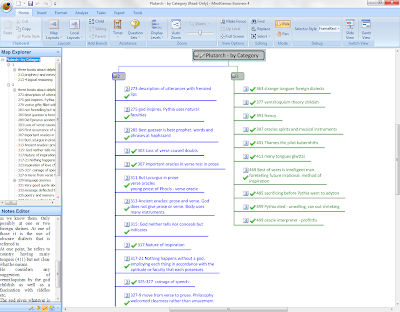 Undo and Redo changes using Ctrl+Z (Undo) and Ctrl+Y (redo). 9. Use F2 to quickly Edit the branch title and use F3 to access the branch appearance dialog and change the style of a branches font, shape, connector or boundary. 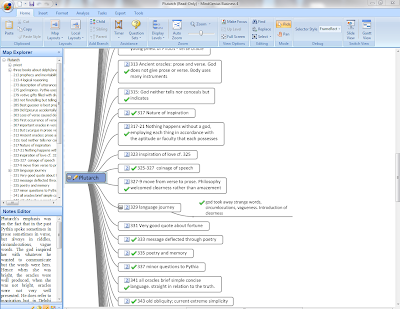 iThoughts with MindGenius support was released recently. While I believed it to be a good option for capturing thoughts on the move, I wanted to see how easy it was to get the info back into MindGenius. I had yet to use it in earnest. Since work and my personal life are especially busy at the moment, I decided to try it for note taking as I commuted to work to capture my actions for the busy day ahead. First of all, you must ensure you have the latest version of iThoughts installed (Version 4.4) or you won’t be able to save your map as a MindGenius OPML. I decided to use a Dropbox account to save my map files to but you can also choose from other options including Box.net and MobileMe. Setting up an account with Dropbox was free and only took a few minutes. I can also invite others to share documents I create in this way. Creating my map in ithoughts on my iPhone was straightforward enough and initially I thought the lack of screen space might inhibit me but it didn’t on this task. I added branches by selecting the branch icon and quickly built up my map. There were a couple of key things I was required to do that day so I added a red flag to them and marked them as a high priority. I then selected the Export Option for MindGenius (.mgopml) and Send to Dropbox, having earlier synced Dropbox with My Documents on my PC at work. 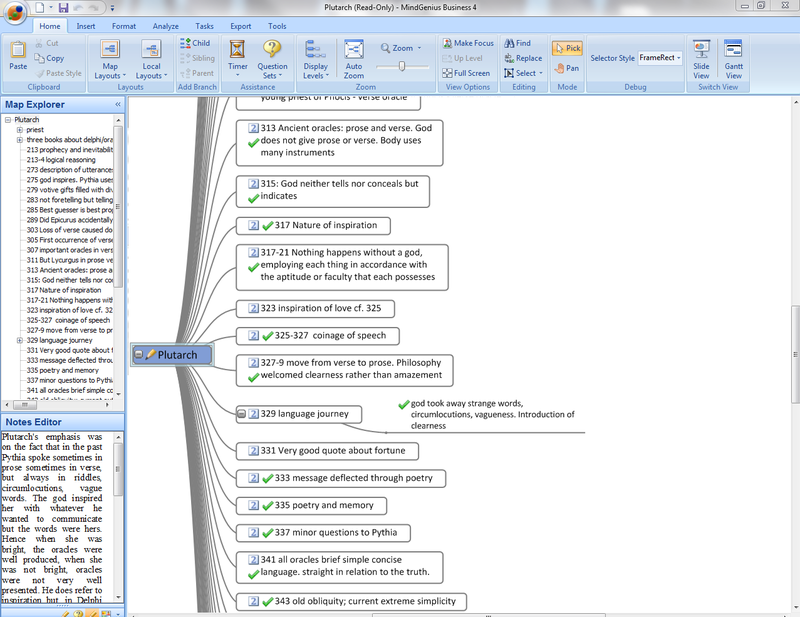 When I arrived at work, my map was waiting for me in my My Documents/ Dropbox folder. To open it, I double clicked on the file icon and my map was ready to use in MindGenius, but you can also open directly from MindGenius by selecting File/Open/ and then selecting “files of type - ithoughts document”. If you want to work with MindGenius maps in iThoughts you can save them as iThoughts files which will create an .mgopml file type. In order to access them on your iPhone you should then save them to your Dropbox folder on your PC, or you can email your maps between your PC and iPhone. I feel that mapping on an iPhone in this way is most useful for note taking, and to do lists which enables me to make more productive use of my commute. iThoughts is also available for the iPad and is available to purchase from the Apple app store.